Cheam Windows have been supplying and installing SAPA Aluminium Windows, a long established product, for many years. These modern grey powder coated SAPA aluminium windows complement this brilliant white painted modern home. The SAPA range of windows and doors can be traced back to the market leading Monarch door and window system. Today the modern alternative is one of the leading residential aluminium window and door systems available, trusted for its excellent aesthetics and design. 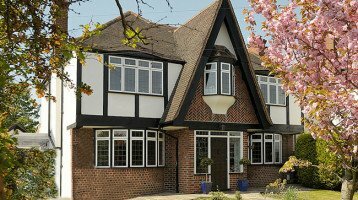 SAPA Windows are provided by Cheam Windows of Surrey, they comprise a wide range of products in both contemporary and traditional designs. These windows and doors are extensively installed though out the UK in British home and their enhanced commercial or heavy duty systems are widely specified in schools, commercial buildings, healthcare and public sector. The Crown casement window has superseded the old Mona-frame window. 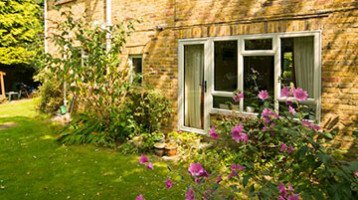 If you had Mona-frame windows installed in the past and with to add to these windows in perhaps a new extension or now install new windows elsewhere in your home, this is the ideal matching replacement. The Crown casement window suite comprises a wide choice of ovolo, chamfered and flat profiles. This ensures that whatever type of property you own, there is a window product to suit it. Crown Casement Windows come with a huge choice of ancillary profiles to allow the creation of complex designs, bay windows, larger screens or to couple to doors. The Dual-frame suite of windows is a contemporary collection of windows ideal for the modern home. Dual-frame comprises wide ranging sections including heavy duty vent and mullion sections to create larger glazed windows and screens. As well as being a contemporary window chamfered and ovolo profiles are available where windows with particular detailing may be required. Dual-frame Windows also benefit from excellent thermal characteristics and full integration with other SAPA aluminium products. If you are looking for the ultimate window in terms of thermal performance, exceeding the current regulations for U Values the Dualframe Si suite is perfect for the modern home. This is a 75mm direct fix window giving outstanding results in thermal testing. 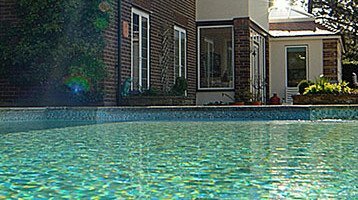 It comprises very advanced thermal break technology meaning less complex glass and cheaper glass options can be used.